The safety of e-cigarettes has been scrutinized in recent years, with many e-cig supporters saying vaping is safer than traditional cigarettes. This “safer” alternative is now being called into question, as a new study published in Pediatrics found toxic chemicals present in the bodies of teens who use e-cigarettes, especially from those using fruit-flavored e-cigarette liquid. 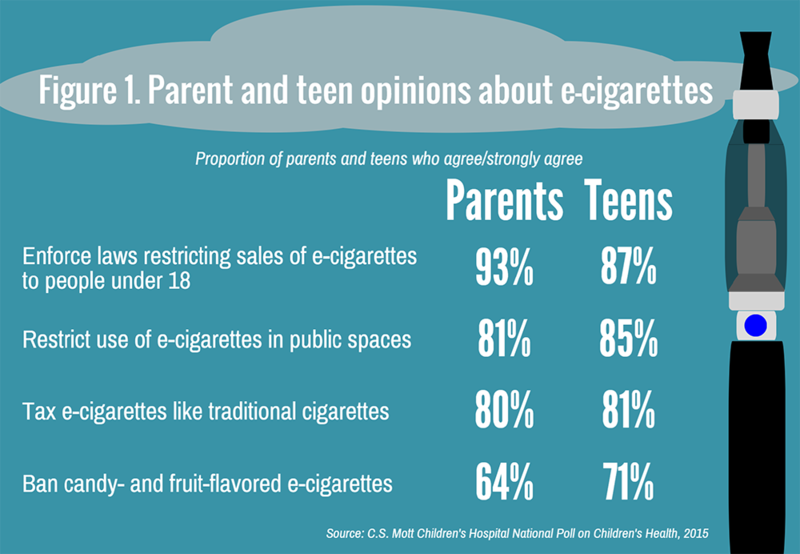 A 2015 Mott Poll asked parents of teens and teens age 13-18 about their opinions on imposing restrictions on e-cigarettes. About 40% of teens said they knew other teens who have used e-cigarettes. Over 90% of parents and teens think e-cigarettes should display health warnings like traditional cigarettes. FDA regulations on e-cigarettes have recently been delayed, causing public health groups like the American Academy of Pediatrics to file a lawsuit, citing a risk of exposure to “lethal and addictive components.” The proposed regulations include considerations for banning flavors in tobacco products.